Sometimes it’s easy to think that only a select few employees or teams need to be creative. But creativity in the workplace should go far beyond the artists and writers in a business. Being creative – thinking of something entirely new or finding a new way of doing things – is important to every department and aspect of a company. That’s why creativity should be fostered by building an environment that inspires it. 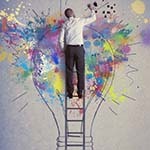 Creativity impacts three aspects of business in particular. These aspects – efficiency, effectiveness, and profitability – also happen to be the areas of business that leaders are usually most concerned about. And that gives business leaders three vital reasons to consider bringing more creativity to their workplace. Another study featured in Psychology Today ties creativity to a business’s ability to compete. “Creativity lies at the heart of the development of new ways of working,” which is how companies differentiate themselves from their competitors. No creativity leads to stagnation, which results in a lack of innovation. The Ernst & Young 2010 Connecting Innovation to Profit study, cited by Psychology Today, concluded that “the ability to manage, organize, cultivate, and nurture creative thinking is directly linked to growth and achievement.” So, with all these benefits on the line, how can businesses foster creativity within their walls? Here are five specific ways. Take Off Some Pressure Psychologist and researcher Teresa Amabile believes that in most cases “time pressure quashes creativity.” In her research of workplace creativity, Amabile found that “employees were 45% less likely to think creatively on high-pressure days than they were on low-pressure days.” So, the more employees feel crunched for time, the less likely they are to think of a new product or solve a problem. The research from Amabile also found that even with time pressure, creativity could thrive “if employees were allowed to focus, undisturbed, on a single activity that they considered truly important.” This means business leaders need to consider what their employees’ days generally look like. Creativity will be killed by “meeting-filled, fragmented ‘treadmill’ days” that leave employees feeling unproductive, unfocused, and short on time. The broader a person’s knowledge, the more creative they can be. So psychologist Robert Epstein, Ph.D, recommended that employers encourage employees to continue learning. “This makes more diverse knowledge available for interconnection, which is the basis for all creative thought,” Epstein said. Epstein also pointed out that surroundings affect people’s creative abilities. Businesses can benefit from creating at least one area that is colorful and different from the rest of the workplace to help foster new, out-of-the-box ideas. Getting out of the office every now and then can also stimulate new thinking. Another article from the American Psychology Association emphasized that it’s not enough to just make work more challenging, engaging, and interesting. Businesses need to “develop policies and practices that enable employees to understand the impact of their work.” This can be done by connecting employees to their company’s end-users through such means as creating events for them to meet customers, circulating customer stories and suggestions, and letting employees experience the business as end-users. While this is by no means a definitive list of all the reasons why and ways to foster a creative environment, the argument for bringing more creativity to the workplace is strong. How have you fostered a creative environment in your workplace? How has it affected your productivity? Let us know in the comments section below.